Cicada | ¿Qué Onda Guero? A cicada showed up in our driveway. 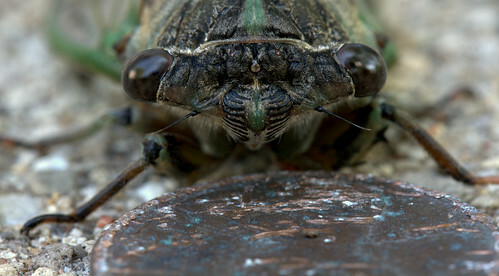 My last encounter with a cicada was cool, but I was disappointed that I didn’t have a macro lens. I have a macro lens now so I didn’t want to miss this. I even used the gorilla pod and the remote trigger. I know, so serious, right? I stuck a penny under his head, to give some perspective. This entry was posted on Tuesday, August 7th, 2012 at 10:25 am	and posted in Uncategorized. You can follow any responses to this entry through the RSS 2.0 feed. Your penny thing does not lend perspective because I’m left wondering: Is that the world’s largest penny? Sorry. Next time I’ll use a jack pine cone. thanks. That would be helpful.